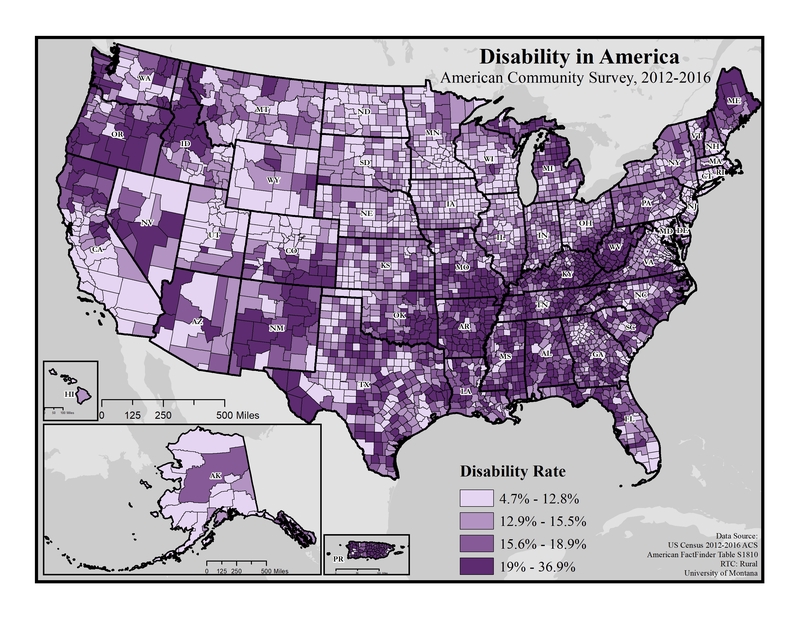 The maps below explores the American Community Survey 5-year data (Table S1810) on disability by county. The ACS asks a set of disability indicator questions to determine disability. If a respondent can answer “yes” to any disability question they are classified as having a disability. Click on the map for a larger, downloadable and shareable version. 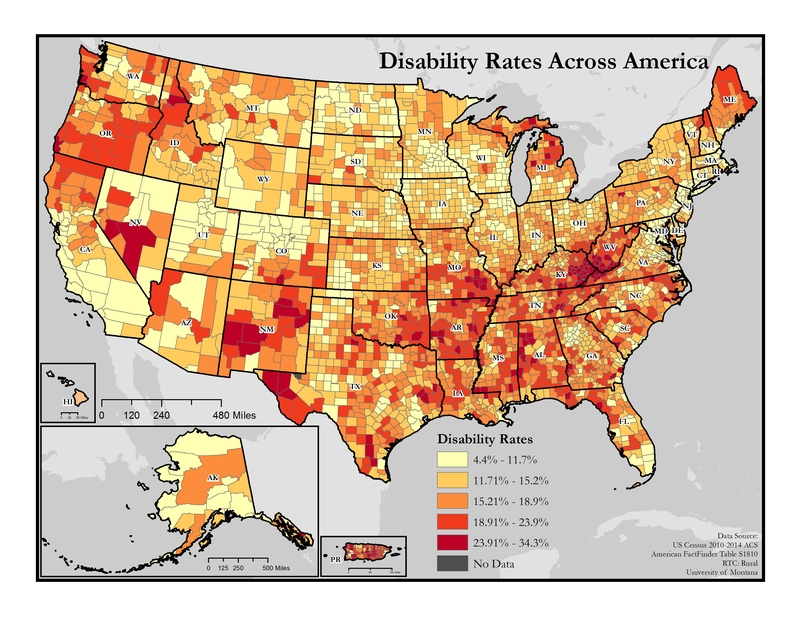 This map of the United States shows general rates of disability by county. Disability rates are broken into four levels: 3.8 to 12.8%, 12.81 to 15.5%, 15.51 to 18.8%, and 18.81 to 34.2%. Rates tend to be highest (18.81 to 34.2%) in the Southeastern United States (particularly in Appalachia), in northern Maine, northern Michigan, parts of the South and Northwest as well as in Puerto Rico. Rates tend to be lowest (3.8 to 12.8%) in the Northern Great Plains, parts of the Rocky Mountain West, the Coastal Mid-Atlantic and Southern California. This map of the United States shows general rates of disability by county. Disability rates are broken into four levels: 4.7-12.8%, 12.9-15.5%, 15.6-18.9%, and 19-36.9%. Rates tend to be highest (19-36.9%) in the Southeastern United States (particularly in Appalachia), and lowest (4.7-12.8%) in the Northern Great Plains and Rocky Mountain West. These regions are all very rural regions of the United States. To browse the data this map was created with, use our Disability Counts Data Finder tool. Map produced October 2018 based on 2012-2016 American Community Survey data. This map of the United States shows general rates of disability by county. Disability rates are broken into five levels: 4.5-11.6%, 11.61-15%, 15.01-18.7%, 18.71-23.6% and 23.61-36.8%. Rates tend to be highest (23.61-36.8%) in the Southeastern United States (particularly in Appalachia), and lowest (4.5-11.6%) in the Northern Great Plains and Rocky Mountain West. These regions are all very rural regions of the United States. This map of the United States shows general rates of disability by county. Rates are broken into five categories ranging from 4.4% to 34.3%. Rates tend to be highest (18.91-34.3%) in the Southeastern United States (particularly in Appalachia), and lowest (4.4-18.9%) in the Northern Great Plains and Rocky Mountain West. These regions are all very rural regions of the United States. 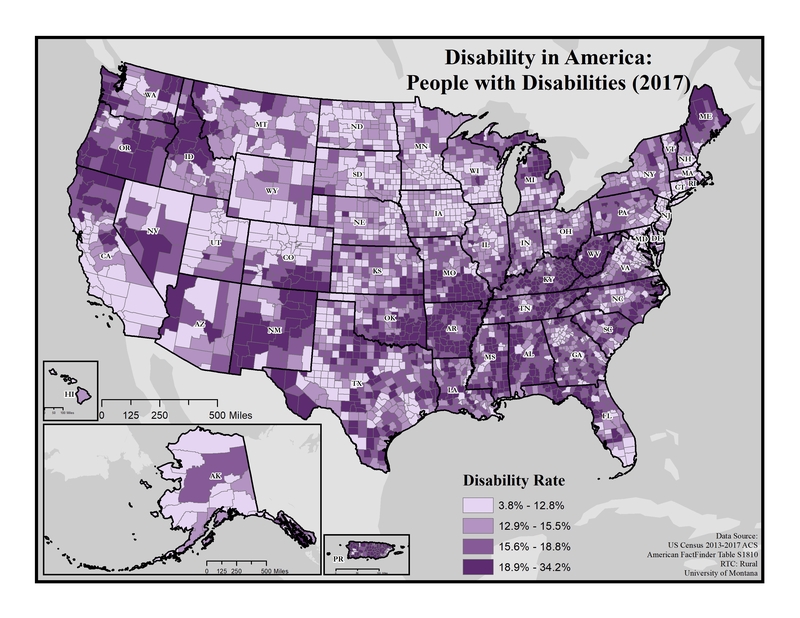 For more maps depicting disability in America, including by disability type, by veteran and poverty status, and by employment status, view our Disability in America Maps Series.